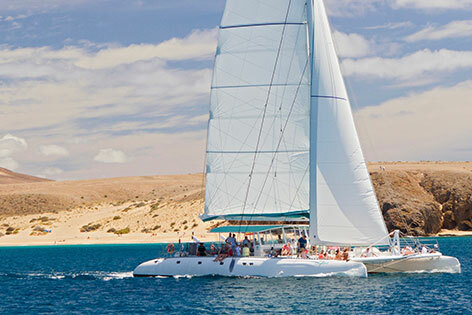 Catlanza is the ideal excursion for families and one of the best catamaran trips in Fuerteventura, once we depart from Corralejo to lanzarote, the kids can take enjoy the nets and feel the spray of the ocean looking out for flying fish and dolphins. The design of the fuerteventura catamaran glides through the water as the captain and crew sail so there is a real feeling of adventure. 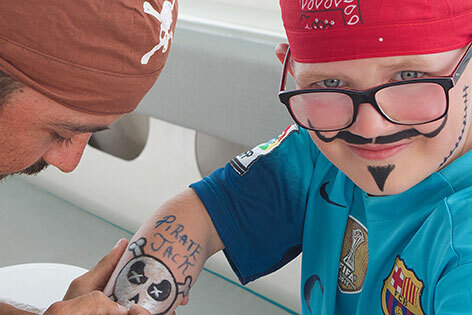 All children are given a special bandanas and cool pirate tattoos, so they look like the belong on the pirate crew. At Papagayo we anchor in the exclusive sheltered bay and it is time for a dip in the crystal clear ocean. With a slide on the Catlanza catamaran which is fun for adults and children alike. Check out the snorkeling equipment which is included, the kids can see the marine life under the water, spotting the many different fish and take some bread from lunch and they will eat from your hand. Then lunchtime for all the hungry crew and pirates, a delicious fresh lunch is prepared and served on board and of course all the drinks are included. 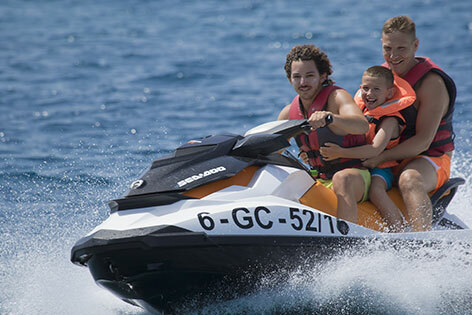 After lunch the engines sound of the jet ski will attract the kids and they can join the instructor for a trip of a lifetime around the bay off Papagayo on our top of the range jet ski, with the pilot of course. All drinks, lunch, transport from resort, jet-ski, snorkeling, pirate activity included in the price.